HOA Board Member Access to Homeowner Mailboxes? 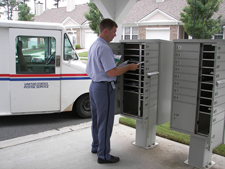 Asked – Does our HOA Board President have the right to access our locked mailboxes in order to put a name card on the box? HOA Boards of Directors should recognize the potential liability that attends violations of state and federal statutes. HOA Boards of Directors should thus consult with the HOA’s legal counsel in situations where the Board’s authority to engage in some desired activity is not clearly provided for in the HOA’s governing documents.